On the heels of post-rock and revered outfits Rival Schools and Far comes a breath of fresh air in the form of I IS ANOTHER – the new brainchild of Jonah Matranga and Ian Love. The two seasoned musicians are anything but strangers to the innovation of sounds, having gotten their hands dirty in a number of successful projects during for over two decades, including both Far and Rival Schools, and the fan favorites Burn, Gratitude, and New End Original, to name a few. I is Another emerges as an artistic entity both connected to these previous projects yet also a stand-alone effort in that it brings something entirely new to listeners’ ears. The band’s debut eponymous release, available on LP incl. free CD on 6/28, combines distinct gritty shades of Zeppelin, Sabbath, and Cocteau Twins with the vocal intensity of Sunny Day Real Estate and Braid. I is Another opens with the single “Queen of Swords”, setting a charismatic wanderlust that carries throughout the album’s entirety. Matranga’s vocal ability is ever-present and soaring, maintaining a confidence and conviction that seeps into your skin upon listening. Tracks like “Shake” and “Prayed For You” bring forth raw guitar tones that are piercing and unmistakeable. Ian Love and Jonah Matranga have certainly been through the ropes together. 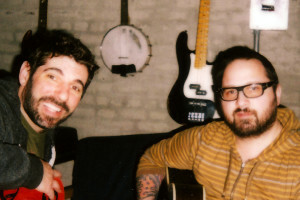 They originally met during Jonah’s days as onelinedrawing in 2001 during the tracking of their split EP with Rival Schools, at which time Jonah was able to see Ian’s production skills in action. “I immediately liked the way he recorded,” says Matranga. “It was simple and relatively stress-free while still interesting sounding.” The duo went on to collaborate on onelinedrawing’s The Volunteers in 2004, and Matrenga’s solo release And in 2007.